The play, in a brief, intense time, takes us through the major episodes of Isabelle’s life. Sydney Blaxill beautifully plays and sings Young Isabelle, breaking out of the cocoon of her life in Switzerland: the Young Isabelle and the grown Isabelle are often on-stage together, the way our young selves are present in our adult lives. We see Isabelle the overcoming the hazards of travel by ship, dazzled on her arrival in North Africa as we are through the vibrance of the scenes, and surviving the death and ceremonial burial of her mother who accompanied her. Now alone, she finds a desert horse, her first friend in the new world, and her beloved companion – I loved him too as I think everyone in the audience did. 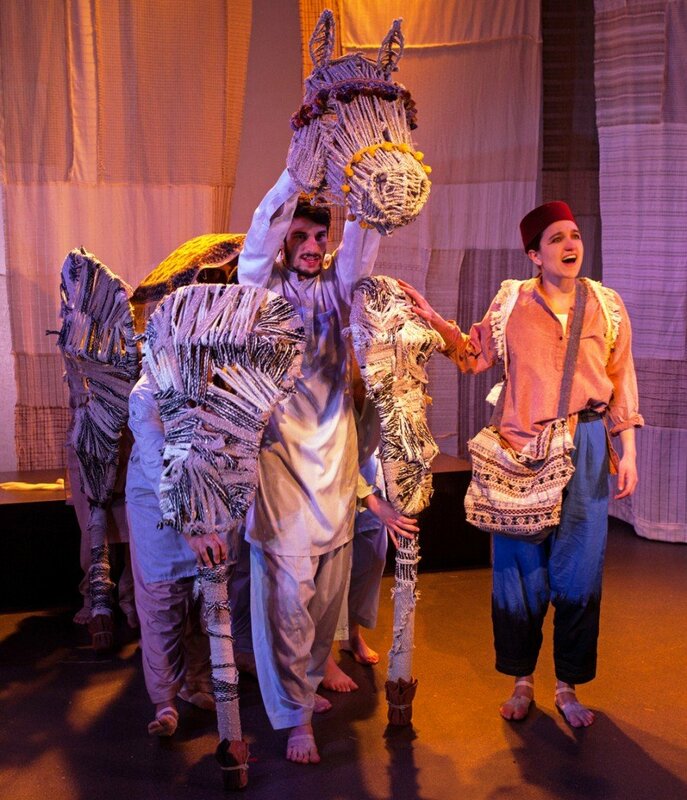 This comforting, nuzzling horse she rides is an open-work construction of what look like birth branches, moved choreographically by the ensemble. Talk about suspended disbelief, this horse is a real – or put it this way, he’s as real as the unforgettable horse in War Horse, and a full match in tenderness, strength and character. Isabelle’s life purpose is to miss nothing – nothing in Algeria anyhow. 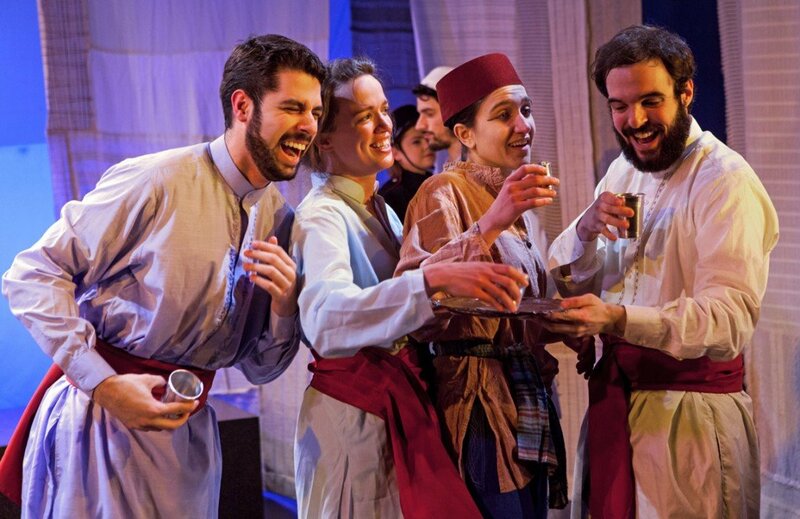 Through a series of episodes, we visit celebrations, funerals, murderous attempts, romantic love, brutality, tender moments, Colonial suppression, hookah parlors, and the flash flood in which Isabelle dies – an exotic panoply of North African culture and terrain. Each episode is a distinct creation of free-flowing visual, musical and dramatic imagination. There’s no blurring. For each there’s different music and a different song – and that makes a remarkable twenty-two songs tracing the stages of Isabelle’s life, each a joyous pleasure. And — what takes it far beyond a series of postcards — each episode brings us deeper into the central character of Isabelle. What a bounty of imagination, brilliant theatricality and strong central character this show is! What density! What a gift! Madonna is fascinating in the role of Isabelle, bringing a kind of rough toughness to the songs and characterization. In addition to Sydney Blaxill as young Isabelle, Madonna is ably supported by a cast that includes Glenna Grant as her mother, Neil Redfield as Slimene, Ryan Stinnet as Vava, and a lavish, talented ensemble of fine singer-dancer-actors. The Nomad is thought provoking, theatrically stunning, and introduces a compelling new character into the world of our collective imagination. 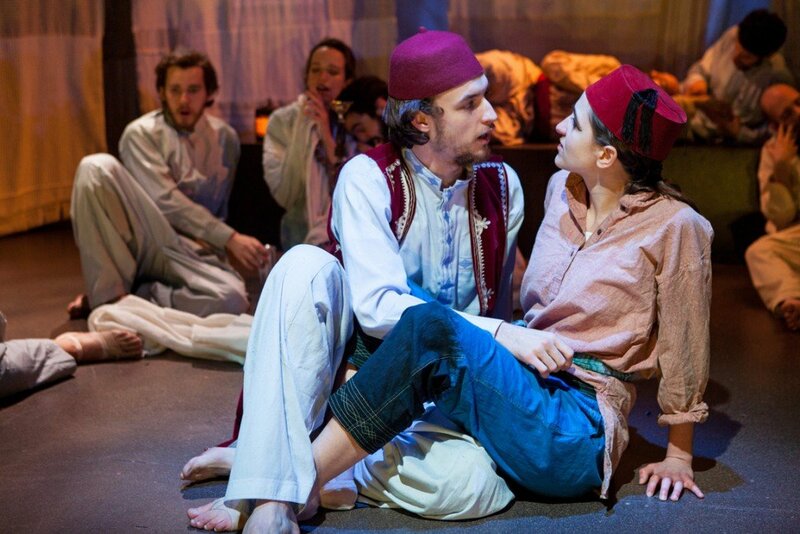 The Nomad plays at The Flea Theater in Manhattan’s Tribeca district through April 6, 2015. Your method of explaining the whole thing in this piece of writing is truly nice. Every one is capable of easily understanding it. I saw this, liked it a lot — nice characterization of a brave woman ahead of her time. Costumes great — especially her costumes, they said a lot about her. It’s good when plays bring out individuals in history you wouldn’t know about otherwise. What was a tour de force! This amazing company puts together a really good opera, excellent choreography, and tells an interesting story. The singing, the acting, the many roles that each performer plays all went to make an evening of great enjoyment and interest. I was especially gratified to see how even handed the creator of the piece was in dealing with the various cultural forces which were at play.